Just under 40 miles away from Houston’s core, an economic juggernaut is quietly settling into its multimillion-square-foot manufacturing hub. Nearly 1,000 employees have moved into Daikin Industries Ltd.’s new industrial plant in Waller County. The Japanese air-conditioning giant’s 4.1 million-square-foot manufacturing plant in Hockley, dubbed the Daikin Texas Technology Park, will eventually employ upward of 4,000 workers, a Daikin spokesperson said. Click through the slideshow for a look inside the facility. The facility cost $417 million to develop. Overall, it’s at roughly 25 percent operating capacity, the spokesperson said. Around half of the plant is dedicated to manufacturing; the other half handles distribution. On the distribution side of the plant, thousands of boxes of Daikin equipment are nearly stacked wall-to-wall and inch toward the ceiling. 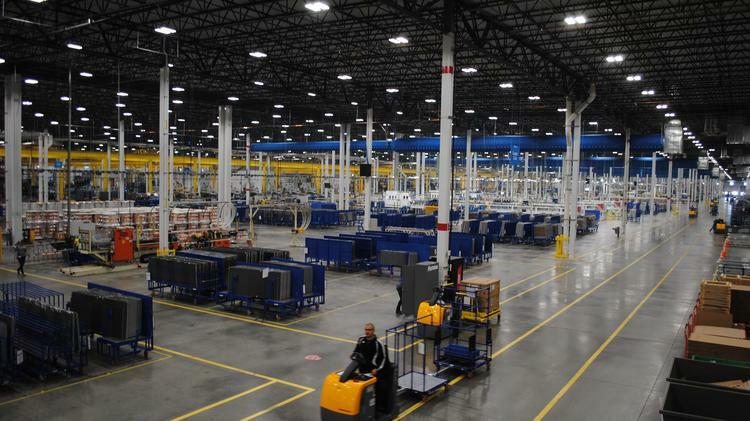 Almost any Daikin or Goodman HVAC product – that is, mostly air-conditioning or heating units – shipped in the U.S. will pass through the new Waller County facility. Hundreds of employees clad in protective goggles and earplugs work through the myriad parts of the plant. They check A/C units for leaks and connectivity issues, oversee the manufacturing and assemblage of valve piping and coils, and whiz through the plant on small, electric load-carrying carts. The plant drums with activity. It’s one of the most technologically advanced facilities of its kind, a Daikin spokesperson said. Automated guided vehicles glide along predetermined paths throughout certain sections of the plant. The vehicles, which basically look like a set of shelves on wheels, are equipped with a sensor that guide the electric vehicle along a white path that’s been painted on the plant’s concrete floor. Some vehicles carry equipment; others shuffle from one operation to another. Even putting the facility’s impressive size aside, its projected economic impact is staggering. It’s expected to deliver $3.9 billion in annual economic impact for the Houston region, create 4,600 direct jobs and more than 11,000 indirect or induced jobs, per Business Facilities, a national trade publication. Daikin selected Houston as the location for its new plant largely based on its acquisition of Houston-based Goodman Global Group Inc. in 2012. The multistate site selection began in 2013, and the facility broke ground in 2015. Prologis was the development manager, the general contractor was D.E. Harvey Builders and the architect was Powers Brown Architecture.